Another Toca success, this app combines the developer’s signature ease of use with fun graphics and the teaching of basic household chores. Young fingers and excited minds will stay busy learning about laundry, vacuuming, and other domestic duties. Like other Toca apps there are very little distractions or complicated tasks, making it both fun and challenging for every age. 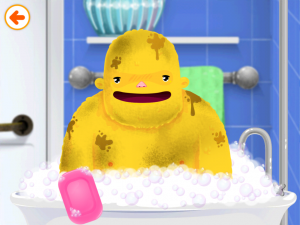 I never thought that I would play an iPad app that would make mopping floors remotely appealing, but at Toca House, the giant yellow monster wants to convince your kids that it is fun. And he actually does a pretty good job at it. 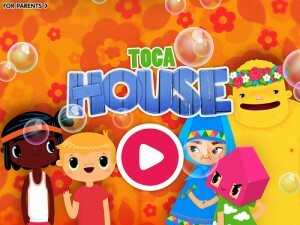 As with the other Toca games – Toca Kitchen or Toca Train to name a few – gameplay in Toca House is incredibly easy and fun. The developers intend for these games to provide younger children with a stress-free and low pressure experience, and in the house, they learn that household duties can be really enjoyable. 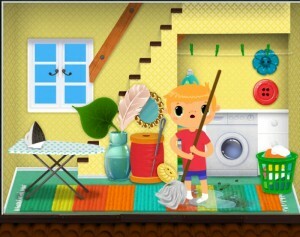 Because it is so open-ended, I could start on any floor in the Toca House and work my way through common chores such as vacuuming, laundry, and even sorting rotting fruit from fresh berries and disposing of the former in the proper manner. In all there are 19 mini-games that portray different chores, and each time I chose a particular mini-game it was slightly different than the last time I played it, adding to the variation that keeps kids interested. Each character evolved as I played the games more and I can definitely see how it gives children a personality with which to identify. I also drew the conclusion that because these characters all happen to live in the same house they’re a family despite the fact that they don’t “look alike”. As a mother I believe that this is a very important message to stress to children as they play, to help explain the diversity of family structure that is becoming more common. I would have given this app a solid five stars had I had some indication about the domestic-duty-is-fun foundation that the developers were going for. I didn’t initially read the letter to parents written for each Toca Boca app so it took me a solid ten minutes of gameplay before I really grasped that the games were all designed to teach about daily chores. 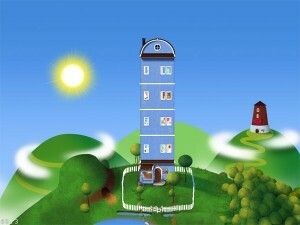 With no solid qualifications other than being a mother to two young children, I heartily endorse Toca House. I appreciate anything that motivates my offspring to use a broom for its actual purpose of sweeping instead of playing Jedi Knight (which inevitably ends badly).